Winlog Lite SCADA Software enabling a wide range of application development and online browser-based access. Factory and plant managers can benefit from using a dataTaker DT8X Series Data Logger to create and configure their Winlog Lite projects. 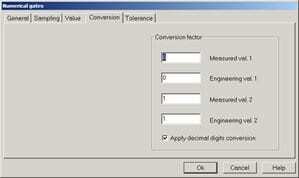 Write down the dataTaker MODBUS_SERVER and ETHERNET profile settings. These contain the information that you’ll need to communicate via Modbus RTU TCP. If you are using an automatic IP address, then you should consider changing this to a static IP address—consult your network administrator about this. When using Modbus, the values are transmitted in integer (whole number) form. This means that the values are all rounded to the nearest whole number. To maintain decimal precision, you can specify a scale factor for the numbers transmitted over the Modbus connection, then divide the value on the receiving end. This is done via the SETMODBUS command. To scale the dataTaker’s channel variables 1-30 by 100 (which would give you 2 decimal places), you would enter the following dataTaker command: SETMODBUS 1..30CV MBI 100. Note that when using the MBI format, the valid range is -32768 + 32767, hence if you use a divider of 100, then you must have values between -327.68 + 327.67. The project shall now appear in the project tree. from the drop-down. The Options window should now appear. 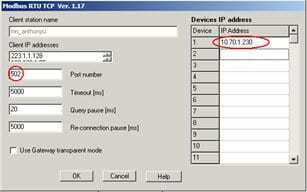 the TCPIP_PORT parameter in your dataTaker and add the IP Address of your dataTaker to the IP address list. Click OK to close the options window, then OK again to close the channels configuration window. Click Add, the New device dialog will appear. Use the default Channel and Device settings (1,1) and enter a description for your device. (40,000 if you need to read/write). Double-click the No Name file to open it. The Template Builder will appear. In the template window, you can choose a range of different controls and images to place on your dashboard. Place the controls on the template, insert buttons, gauges, pictures, charts etc. Remember to save the template as you build it up. To assign variables to your controls, click on the Gates option in the property editor, on the left of the screen. Follow the prompts to add your gates to the list. Once you have completed adding components to your dashboard, save your template and choose the template window. To run your dashboard, open the Project Manager and right-click on the project name and select Execute. Once the project opens, click Supervision, Template, Template name. If you would like a template to automatically open whenever you execute the project, you can follow this procedure. First, let us make the current project the default. To do this, right-click on the project name and then click Default. Now the project will have a green border around its icon to indicate that it is the default project. The Available Templates list can be seen on the left. From this list, double-click the template you wish to open at startup. This will transfer it to the Selected Templates list. For further information on the Winlog Lite SCADA Package with DT80-Range Data Loggers or for additional technical support, contact a CAS Data Logger Technical Specialist at (800) 956-4437 or request more information.